Starting as off as a drummer at age 15, Stephen (S.G.) Sinnicks played with Tom Wilson, Ray Materick, Stompin' Tom Connors, and many others. Later on, Sinnicks decided to pick up an acoustic guitar and began to play his unique music that interweaves folk, celtic, singer/songwriter, and more. As a solo artist, he has opened for Spirit of the West, Junkhouse, Fred Eaglesmith, Garnet Rogers, Ronnie Hawkins, and Teenage Head. On occasion, the guitarist has also teamed up with the popular Celtic band, the Tartan Terrors. Check out his web site and if you like what you hear, make sure to purchase a few (or all) of his amazing CDs. The video podcast site, Talkin' Blues recently great posted footage of Harmonica Shah's band (which includes local guitar master Jack deKeyzer) recording "Cryin' Won't Help Me Now". Jack can be seen rocking out to the amazing tune. Talkin' Blues has an amazing collection of interviews/performances from Paul Reddick, Colin Linden, Carlos Del Junco, Julian Fauth, Mel Brown, Bill Bourne, Fathead, Harry Manx, Watermelon Slim, Billy Boy Arnold. In a recent e-mail newsletter, Hamilton Bluesman Steve Strongman announced that his most recent CD, Blues in Color was the only Canadian disc to enter Roots Music Report's Top 20 list for the week of July 10. Steve Strongman has been having a good year. He opened for Buddy Guy a while back and was recently the surprise opening act for legend Joe Cocker. Congratulations to local instrumental folk/roots group, the Acoustics, who were recently nominated for a few, well-deserved international awards. The Acoustics, the only Canadian artists to be nominated in this category. Not bad, eh!!! NEW! Update from their Myspace blog: Unfortunately we did not win the award for World Album of the year. However for what it’s worth we came in 2nd place! Second out of ten nominees is not bad. According to the LeE HARVeY OsMOND Facebook Fan Page, their new DVD Live @ The Tractorgrease is available at their shows and DivineIndustries.com. LHO features local rock star Tom Wilson (Junkhouse, Blackie and the Rodeo Kings, Florida Razors) along with members of the Skydiggers and the Cowboy Junkies. Below is a sample clip from the LHO DVD. Click here if you can't see it. Hamilton music veteran, Mark LaForme brings lot to his incredible music. He can easily handle blues, soul, country, rock and a whole lot more. He's performed with Ronnie Hawkins, Jeff Healey, Colin James, Stompin' Tom, and many other talented musicians. LaForme's live music has graced the Rez Bluez TV show, Gretsky's inauguration into the Hockey Hall of Fame, the Canadian Armed Forces in Bosnia, and countless other gigs. His album Vintage was also nominated at the 2006 Hamilton Music Awards. Earlier this year, Burlington's Melissa-Bel released her self titled CD EP. There's a little bit of everything on this disc. Bluesier numbers such as Distance (co-written with Ray Lyell) and He'll Never be You share the spotlight with soulful pop-folk gems like We All Lose Our Way, I Hate to Say it and Tragedy in Disguise. Melissa ends this amazing collection with a smooth version of Smokey Robinson's You've Really Got a Hold On Me. Click here for some samples. Toronto's Sean Ashby lends his guitar and Mark McIntyre plays bass on most song of the songs. Other guests include Danny Lockwood (Drums), Craig Lapsley (Drums), Jesse O'Brien (Piano) and Bill King (Piano), and more. 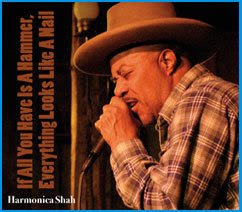 Talented bluesman Harmonica Shah may be from Detroit but he knows exactly where to find great blues players. Hamilton's own Jack deKeyzer plays guitar on his latest CD, If All You Have is a Hammer, Everything Looks Like a Nail. Joining Shah and DeKeyzer are Canadians Alec Fraser (Jeff Healey, Jerome Godboo) on Bass and Al Cross (Big Sugar, Jerome Godboo) on drums. Juno award winner, Julian Fauth also lends occasional piano to the disc. Most of the same group teamed up for Shah's previous CD, Listen At Me Good as well. If All You Have . . . is good old fashioned blues in the style of Howlin' Wolf and Muddy Waters with a bit of soul. DeKeyzer's guitar prowess is evident on all tracks. There's booty shaking boogie and some amazing slower numbers too. The CD is available online, including as an e-music download. 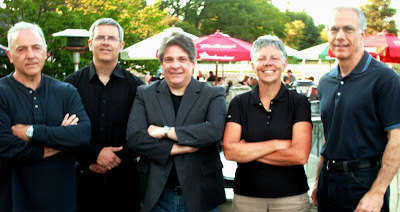 The Ron Palangio Group is a talented, versatile band that can play jazz, rock, pop, and more. They also perform as a two to five piece unit, depending on the venue. Each member is a skilled music veteran. The group is available for weddings, banquets, and other special events. To celebrate 20 years of rocking the blues, Trickbag threw an incredible show on June 12, 2009 at the Fieldcote Park in Ancaster. The veteran band were joined by Denis Keldie, John "Ghetto" Gibbard and the legendary Sonny Del Rio. Michael O'Brien, an amazing musician and beloved father of performers Jesse O'Brien and Matt O'Brien passed away on July 8, 2009 at the age of 65. Our condolences to his family. O'BRIEN , Michael Joseph Peacefully at the Dr. Bob Kemp Hospice on July 8, 2009, at age 65. Loving father of Jesse Michael, Matty and Natalie. Known to many as OB, he was a fantastic musician, pool player, golfer and dad. His love and passion for music will undoubtedly live on through his children. Cremation has taken place and a private service will follow. If desired, memorial contributions to the Dr. Bob Kemp Hospice would be appreciated by the family. "He had an uncanny ability to pick songs that people would respond to. And no one could do those early Elvis covers from the Sun records days like OB. It's sad when someone who has so much to offer is taken at such a relatively young age. Fortunately, he had time to pass on his musical abilities and instincts to his sons, Matt and Jesse (Michael). I know they'll carry on his musical legacy for years to come. " Currently touring across the country, Blind Mule call Hamilton home. Their sound is a unique melting pot of roots, alt-country, folk with modern elements. The guys can even get funky when necessary. Their debut album The Gallery was nominated at the 2008 Hamilton Music Awards for Best New Alt/Country CD. Alfie also previewed the title track for his upcoming CD. He's planning to release it in the fall. Hamilton rock legend, Dave Rave, has released a two song EP on iTunes. Streets of Liverpool is a catchy poppy number. 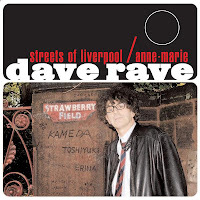 The song Anne Marie (done with the Plastic Heroes) is more rocking but still with a poppy flavour. Local drummer John "Babe" Myles passed away on Thursday, June 25th. Our condolences go out to his friends and family. He played many years with King Biscuit Boy, the Capris, the Chessman and the Stingrays. 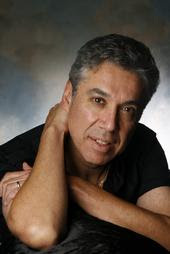 Former bandmate, John LaRocca (Stingrays), said he was "one of the best blues drummers around"
NEW! Click here for Jamilton's in depth piece on Babe. 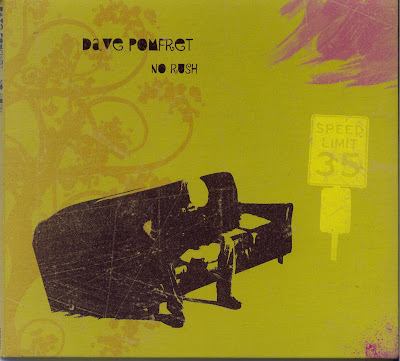 Former Munday Nuns members, Dave Pomfret's new CD: No Rush, is an amazing collection of songs that's hard to pin down stylistically. Dave (aka Salsa Dave) goes from catchy, rockin' riffs to mellow melodies. On the way, he touches on folk, rock, and even bits of pop and country thrown in. Joining Dave in making this great music is former Nuns bandmate (and former Killjoy) Mike Trebilcock on guitar and many other instruments. Mike also produced the disc. A number of other talented performers aided and abetted the singer/songwriter, including: Mark Mcintyre (bass), Aaron Goldstein (Pedal steel guitar), Craig Lapsley (Drums), Troy Dowding (Trumpet), Darcy Hepner (Sax, Organ), Rosemary Hale (Violin), Sarah Honeyford (Cello). On Background vocals there's Mary Simon, Jean Caffeine, and the Mississippi Kings. The album was also a family affair as his wife, Karen Sturrock and his stepchildren joined on backing vocals. His son, Brier Pomfret, plays the piano on it as well. Click here to listen to songs from No Rush. Below are videos from his CD Release (and birthday) party on June 30, 2009. Click here if you can't see them. Dave's step-daughter (and future superstar) Sarah Ivanco, came up and sang to start things off. She wowed the crowd.